Today I make every day a play day by balancing my time between my fabulous home studio and showroom, tending my lush West Coast garden, volunteering at two local Arts Councils and nurturing loving relationships with my family and friends. It is an ideal lifestyle in which to nurture the artist within. My husband and I run a full time business called Turning Point Arts. He works in the digital world in his pristine studio and I muck with clay in mine (not so pristine!). We are having fun with our creations and love to welcome folks to visit our studios, enjoy our garden and purchase our goods and services. 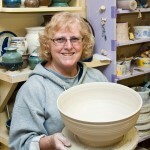 When someone chooses a handmade piece of functional pottery, they are acquiring a small piece of that artist’s soul. The maker has put time, love and energy into the piece that is permanently embedded within. It is a great honour to have my pieces become part of the user’s daily rituals of nourishing their family, celebrating life’s milestones and the sharing of their experiences around the dinner table. When people surround themselves with things they love, whether it be a functional pottery piece or a beautiful clay artifact for their home, they are rewarded with a sense of joy and pleasure. What could be more important, as an artist, than to be a small part of that world? Making art is a pleasure, making beautiful things for everyday use is an honour.